From the roof to the floor, each and every component of our portable buildings is made of the highest quality materials and meets the strictest construction standards in the industry. The Smart Roof Design of every Cook shed includes our 30-Year Architectural Shingles and OSB Decking, manufactured from waterproof adhesives and protected by an Aluminum Drip Edge. These features ensure that anything stored inside your Cook shed stays safe and dry. The Vented Roof helps ventilate your portable building and protects your belongings from excessive heat. All of the shingles used on Cook buildings are grade “A” shingles that carry a 30-year manufacturer’s limited warranty. 2×4 trusses are placed 24″ on center and gusseted to add strength to the roof system to keep it from sagging from the weight of snow and ice. 7/16″ oriented strand board (OSB) is used for roof decking because it is manufactured with heat resistant glues that prevent delamination and warping. An aluminum drip edge prevents water damage to roof decking from siphoning of water along the edge of the shingles. Venting the roof at its peak along the ridge provides superior ventilation. This technique helps prevent damage to shingles and your stored property that may be caused by excessive heat. Our Metal Roofing Systems are constructed with 29-gauge steel and come with a 40-year manufacturer’s limited lifetime warranty on the paint. They also include 2 X 4 gusseted trusses for increased support against excess weight. A Cook metal roof is an attractive alternative to a shingled roof. Shallow Groove Siding adds durability to the building’s sidewalls by protecting inner plys from weather exposure, which can result in the separation of the plywood. Our sidewalls include Double Stud Construction where sheets of siding meet. This prevents separation from the expansion and contraction of the siding and adds strength to the entire wall system. Our exclusive 19/32″ LP Smartside Shallow Groove Siding enhances the aesthetic value of Cook buildings while retaining strength and integrity. Using Shallow Groove Siding significantly reduces the possibility of delamination. Our 2 x 4 wall studs are placed 24″ on center with Double Studs put where the siding meets. This technique provides a larger nailing surface and prevents separation and gaps at the siding seams. The 2 x 8 top wall plates (in barns and lofted barn models) are notched to allow the siding to be placed into the framing, rather than nailing the siding to the sidewall frame. This technique increases the strength and durability of the building and creates a better seal against the effects of weather. Note: Utility buildings have 2 x 4 top plate with box soffit. Ring shank coated nails are used throughout the sidewall construction of our shed. These fasteners provide maximum holding strength against swelling and contracting caused by changes in weather or humidity. These straps provide superior protection from damage due to high winds. Hurricane straps are available in some areas. Our high quality Door Features including Storm Chains and Locking Door Handle, add security and durability to your Cook building. We use Storm Chains to prevent potential damage caused by high winds. Two adjustable tension rods are installed on every door to prevent warping as the shed is exposed to the elements over the years. Our locking door handle provides enhanced security for your items and works despite the possible settling of your Cook shed. Every door is installed with three heavy duty 6″ zinc plated hinges to provide maximum strength and durability. We add a durable aluminum plate to the threshold of every Cook building to provide additional protection against daily wear and tear. Our Cook Warehouse Floor Systems are designed for maximum durability and mobility. The floor joists fit into Notched Floor Skids to allow movement of the building without damage. Floors are constructed of 5/8” LP ProStruct Flooring with an available 3/4″ heavy-duty option. This feature prevents the floor system from sagging under the weight of heavy items. We use the highest rated lumber for direct ground contact for the entire floor system including skids, floor joists, and decking. 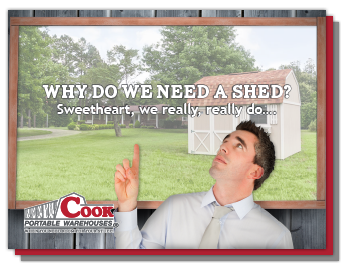 This enables Cook to extend a lifetime warranty against decay or termite damage on every one of our sheds. The 4 x 6 pressure treated floor skids are notched so the floor joists can be recessed into the skid. This provides added strength and durability and allows for movement without damage. (Note: 8 foot wide buildings have 2 skids and 10 and 12 foot wide buildings have 4 skids each). Contact rated floor joists are placed 16″ on center and covered with 5/8″ LP ProStruct flooring to provide added strength. This decking prevents the floor system from sagging under the weight of heavy possessions. Pulling blocks are installed with holes drilled at each end of the centermost skids. These blocks help prevent damage if a building needs to be moved.